The pen is a stylish Stylish ballpoint pen with a plastic container and metal print mechanism and clip. The pen has a blue ink refill and is available with a white body and colored accents. 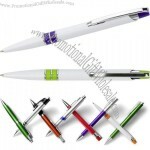 Promotional Click action Plastic ballpoint pen with translucent clip and trims. Pen in translucent colors with chromed clip and plunger and silver gripper and tip.